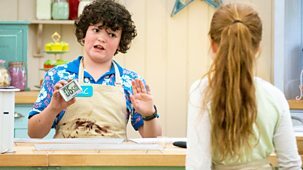 Junior Bake Off Catch Up? 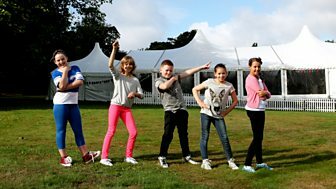 Junior Bake Off is an exciting new series where junior bakers take on the greatest baking battle on Earth. 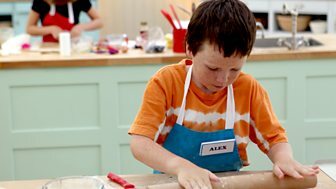 In each programme the bakers take part in a series of challenges baking cakes, biscuits, bread and pastries. 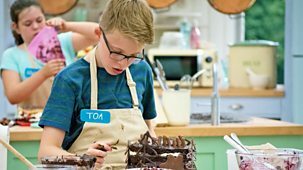 Baking competition. 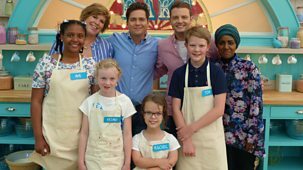 In the grand final, the four finalists bake two of their own recipes for series judges Mary Berry and Paul Hollywood and a party of invited friends and family. 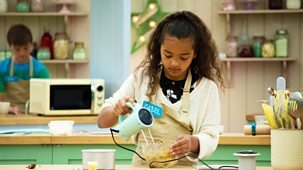 Baking competition. 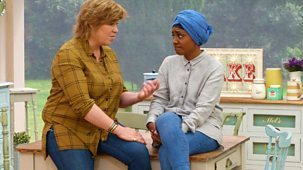 The four finalists must undertake the knowledge test - a series of questions and practical challenges set by series judges Mary Berry and Paul Hollywood. Baking competition. 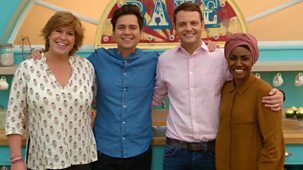 The four remaining bakers show they can bake to a professional standard as they undertake a baking masterclass from award-winning pastry chef Cherish Finden. 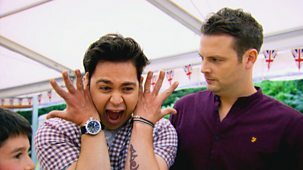 Baking competition. 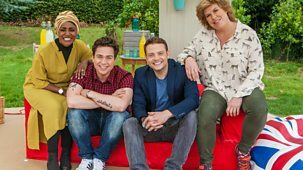 Four hopeful semi-finalists prepare mini pizzas using Paul Hollywood's recipe, followed by sweet pastry tarts for a seaside picnic. 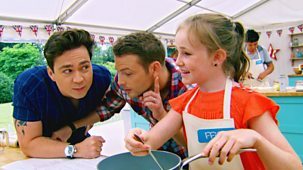 Baking competition. 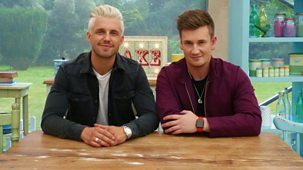 In the first semi-final of the series, the competition gets much tougher as Saffron, Joe, Kieran and Cameron show off their skill at making bread and pastry. 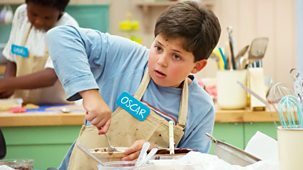 Baking competition. 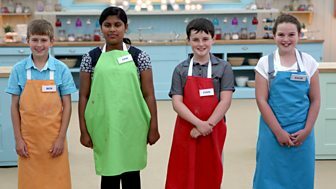 It's the final heat of the Junior Bake Off and Sam, Cameron, Aasiya and Freya are battling to win a place in the semi-final. 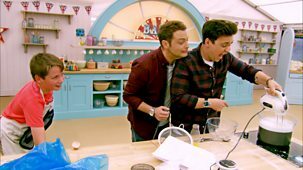 Baking competition. 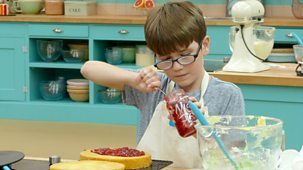 Kai, Sami, Abigail and Olivia are up against the clock in the Technical Challenge as they attempt to bake the ultimate lemon drizzle cake in an hour. 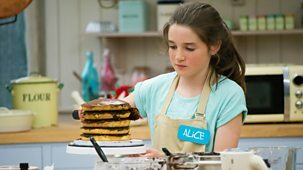 The country's best young bakers face the biggest baking battle on earth. 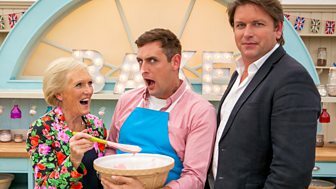 Four bakers face another serving of challenges, as they battle for the last place in the semi-finals. 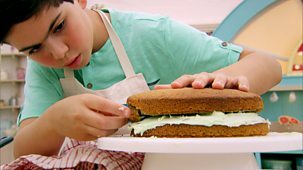 The country's best young bakers face the biggest baking battle on earth. 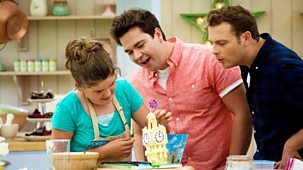 Another serving of brave bakers compete for the second to last place in the semi-final. 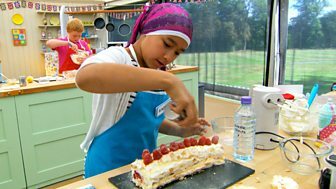 The country's best young bakers face the biggest baking battle on earth. 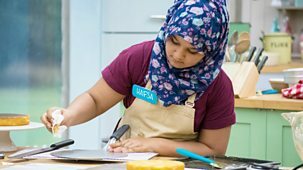 Four young bakers face the technical challenge, then produce a cake inspired by the future. 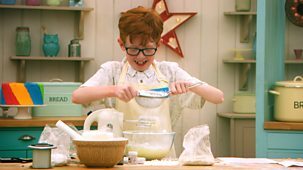 The country's best young bakers face the biggest baking battle on earth. Four bakers attempt James' recipe for cheese straws, followed by a creation of their own design. 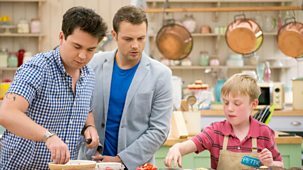 The country's best young bakers face the biggest baking battle on earth. 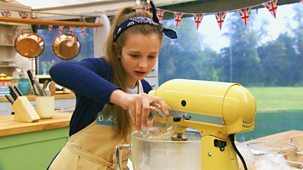 A new batch of junior bakers attempt Mary's recipe for delicate Welsh cakes. 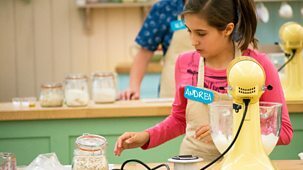 Baking competition. 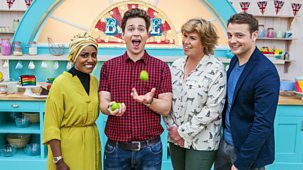 In this royal-themed programme Jim, Scott, Sangita and Galway go head-to-head in a baking battle, contending with cheese scones and cakes for royalty. 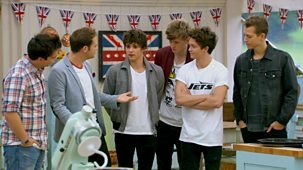 Baking competition. 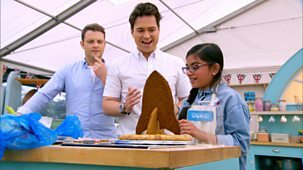 The four contestants tackle an animal-themed Invention Challenge where the cake creations include a chocolate hedgehog and a coffee-flavoured civet cat cake. 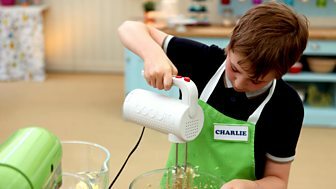 Baking competition. 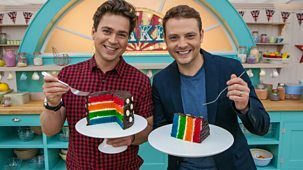 The four contestants create cakes to celebrate their favourite festival - offerings include cakes for Diwali, Halloween, Valentine's Day and Bonfire Night. 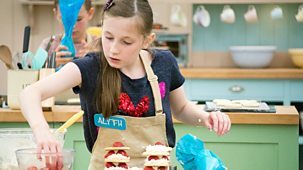 Baking competition. 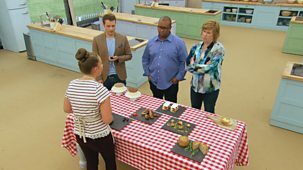 In the second of the heats, the bakers must show off their own recipes for a chocolate celebration cake. 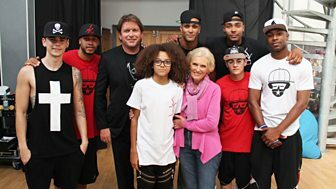 Baking competition. 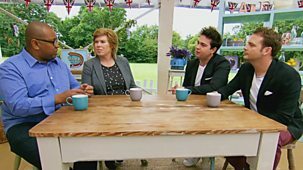 In the first heat, four hopefuls must wow judges Mary Berry and Paul Hollywood with their own amazing 'cakes from outer space'.